My past attempts at the perfect macaron have not all been met with success. Many of these cookies have suffered the fate of the trash can with their cracked shells and hollow centers. I’ve tried many online recipes and even tried going back to an original recipe I used back in my pastry chef days but all of them have yielded spotty results. In my vast online research I’ve been unable to find a consistent go-to recipe that works for most people. With frustration setting in, the eater has come to the recipe with a few reinforcements; French Macaron cookbooks. Let me start with this disclaimer: I do not speak, read, or even really understand French. I’ve never been to France. I’ve never taken a French class. The closest to France I’ve ever been is Montreal where they speak French, but I still didn’t understand what people were saying. 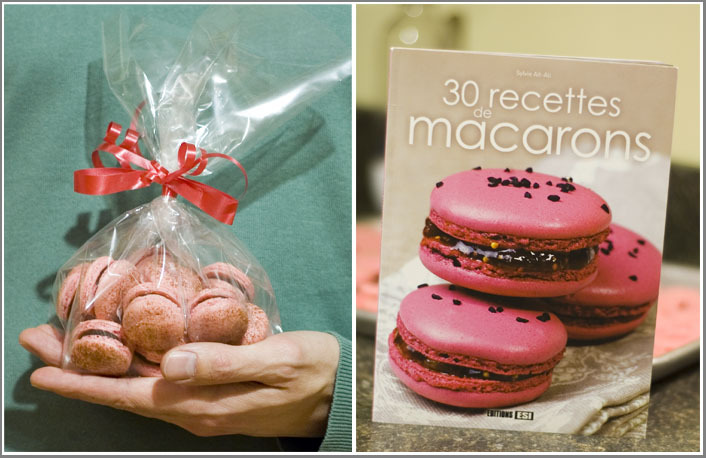 The cookbook I tried out was 30 Recette de Macarons; I’m pretty sure that means 30 recipes for Macarons. There was a whole bunch of French directions that I glazed over after I saw the ingredients and, I confess, skipped one-hundred percent. I know I could have spent time typing everything into google to get a pretty bad usable translation of the recipe, but I was too excited about the new book, the simplicity of the recipe, and the excitement of trying yet another macaron recipe. I cooked these at 320F. I double-panned them while cooking. As you can see, filled with a nice chocolate ganache, these macarons came out nicely. This recipe seemed to work, was easy to remember, and didn’t deviate from the techniques I’ve already learned. I think this book may be a keeper! Hi, I also made many failed batches, until I finally got the hang of it. It seems the recipe isn’t all that important, it’s about working your batter to the right consistency and cooking at the right temperature. how did you find this book? I can’t get it anywhere! Dude- you got to send me the spare ones via mail. Joy – I actually prefer the neater foot, when the froth out too far, they look messy to me. The ones that came out look great! Don’t kid yourself, we all get a nice dose of exploding macarons from time-to-time. The batter ended up being thick and very much like thick magma. I’ll try the correct recipe next time and see the difference. Thanks again! Joy – I made these using a French Meringue which is just beaten egg whites and sugar; no hot syrup this time. For ease of mixing I whipped 2 egg whites with the 100g of sugar and the other egg white was incorporated into the almond powder/confectioners sugar mixture. Don’t be afraid of making them. They may not come out all pretty at first, but they still taste good even when they crack! For the syrup — did you still use the 150g sugar to 50g water? And how did you portion the egg whites — still 60 in the mixer? then the remaining 40g mixed with the almond powder and confectioner’s sugar? It’s my first time making these and I’m so confused and scared of macarons. Wow these looks absolutely gorgeous!well done. Love the pink and brown choc dust on them. Lovely lovely. Leslie: Should be no problem to make them black or orange or whatever color you’d like. The filling, as you know, is only limited by your imagination. These are beautiful! In your opinion, do you think that the recipe can be altered to fit a Halloween theme? Thought I would ask before trying to purchase this recipe book. These are perfectly shaped and they look delicious! I have never made Macarons before, but this is inspiring to see all your hard work and diligence in finding a good recipe. I want to try and make some macarons with this recipe. May I trouble you for mixing directions? Trust me, making macarons is never perfect. I’ve lost count on how many pans I’ve tossed over the past 3 years of making them. The first step is attempting them and then trying to get a product you are happy with in the end. These look beautiful! I have forgone the urge to make macarons because every other food blogger has already done the perfect versions and I thought who could compete. So what’s the method of this recipe? I’ve just had my fourth macaron failure. I tried Italian meringue for the first time and it seemed so promising up until they started puffing up and cracking while baking! I feel like each time they turn out worse and in a different way. I think my first batch I ever made turned out the best, but certainly could’ve been better. Your macarons look great though! I can only hope to get such wonderful results. 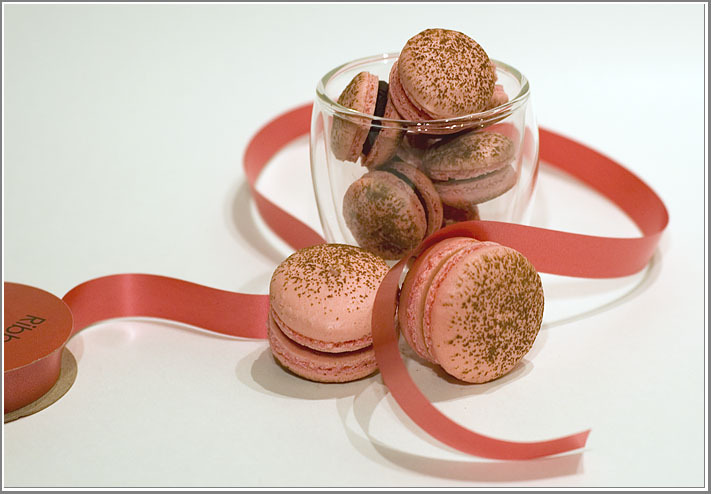 I just loved you macaron recipe! They look so lovely. I will try the recipe!